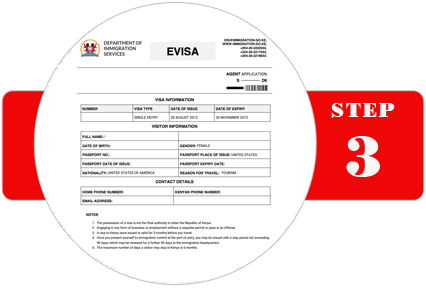 Please enter your information into online forms to process your eVisa to Kenya at the link Apply for Kenya eVisa. In this step, you are required to enter the exact personal information of the applicants. After receiving full payment for Visa Service Fee and Kenya Government Fee, you need to provide some extra documents to complete your application form when we require. After finishing step 2, please check your email from us for your confirmed information, and we will let you know when you will have your Kenya eVisa . Get the eVisa within 2 business days for urgent service. Get the eVisa within 1 business day for super urgent service. The eVisa will be processed and issued electronically and sent to you via email. Please print your Kenya eVisa that we send you via email to board the airplane. 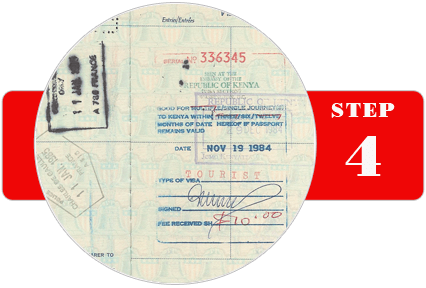 When you arrive in Kenya with a valid eVisa , you may have biometric information taken at the airport, and a stamp placed inside your passport.